Before the rise of popularity of the feminist thought, there were many great female photographers. But the discourse accompanying their work at times could be rather patronizing. From today's perspective it may seem that one of the most outrageously "anti-feminist" articles was actually written by a woman photographer. — Gisèle Freund, “Women as Photographers." Camera, May 1954, p. 229. Of course, this is just one article and I don't think that such statements as Freund's "intuition and re-creative rather than creative power are typical feminine qualities" were necessarily shared widely among photographers and artists. Let's just remember that the most popular and most influential photography exhibition of the 1950s, The Family of Man (curated by Edward Steichen and opened in MoMA in 1955), demonstrated a move towards inclusion and equality regarding female photographers' work: out of 462 images in the show whose makers are known, 80 images, or brave 21%, were by women photographers. Meanwhile, companies continued to promote little and cute "women's cameras" as fashion accessories, not unlike shoes or perfume. 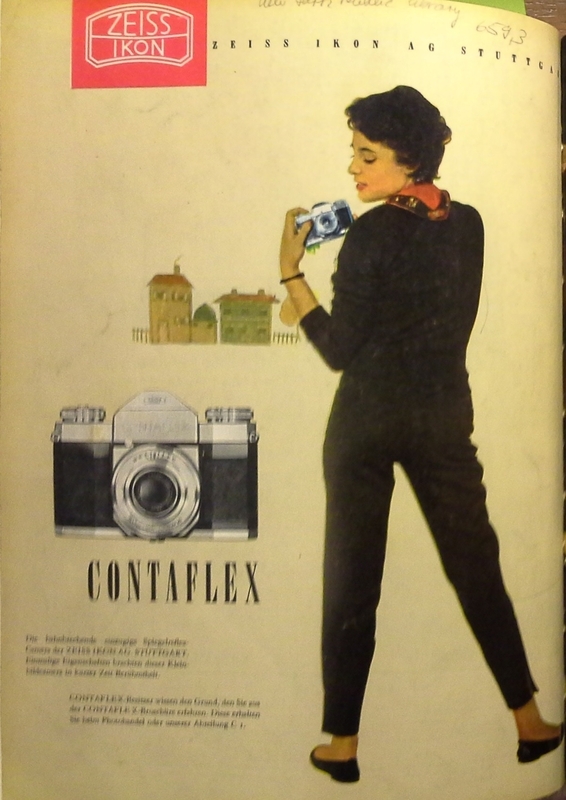 There's nothing essentially wrong with that, and perhaps ads like Zeiss Ikon's campaign actually introduced many young middle-class women to photography. It became an active image-making practice, mostly for private enjoyment or sharing with close friends and family. There's much more wrong with the fact that many of later art and photography historians have purposefully diminished the importance of such image-making practice and pushed it into the lowly categories of "amateur" or "vernacular" photography, which doesn't require serious scholarly attention just because it was not public, explicitly political, and aesthetically radical. I don't think that it is enough to make women's work less worthy of research and analysis. Listen again to what Freund said in 1954: women photographers "are not easily attracted by political or current events, but they distinguish themselves in portraits, children’s photographs, and they know how to capture with subtlety every expression of everyday life." What if she was right?